We are glad you plan on coming back! We hope that you will find our online registration process convenient and as pain free as possible. This guide will help you access the online registration. Navigate to https://lcsd2.infinitecampus.org/campus/portal/lincoln2.jsp. Please make sure that you have pop-ups allowed in your browser. Log in using your Infinite Campus credentials. If you don’t know your credentials, email tanner.crook@lcsd2.org. On the left hand menu at the bottom section, select the link ‘Online Registration’. If the link is not present, we are not accepting registrations. Select ‘Click here to go to Existing Student Registration’. 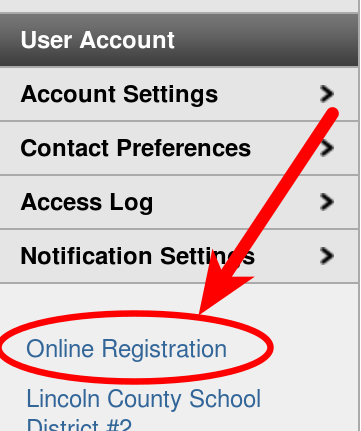 The page will show students in your household that are currently attending LCSD#2. Select the registration year and ‘Begin Registration’. If you need to add a new student, you will have the option later. Select ‘Begin’, after you have noted the information. You will now be at the registration. Most of the information will already be present. Review each pleat and work through the tabs. You may go back and make corrections or fill in missing information if needed. The Household tab pleats contains information about your household such as house phone and addresses. The Parent/Guardian tab allows you to add parents and/or guardians to the household. For each you add, you will have additional pleats to fill out. The Emergency Contact tab allows you to add parents and/or guardians to the household. For each you add, you will have additional pleats to fill out. You must at least add one. The Other Household (Not to be enrolled) tab allows you to add other individuals in your household that are not going to be students. An example would be a child that is too young to attend Kindergarten. Adding future students now helps us plan for upcoming levels of students. The Student tab allows you to add students to the household. For each you add, you will have additional pleats to fill out. If you need to add a new student, you may do so here. Once you have filled out all of the required information, you can submit your registration.